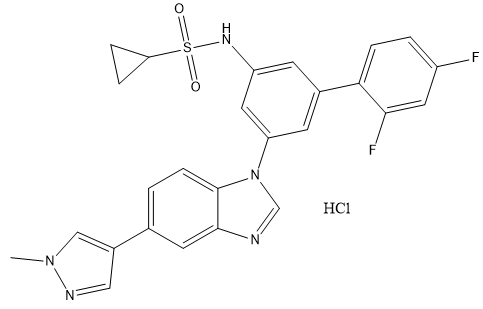 ODM-203 is a potent, selective, dual inhibitor of FGFR and VEGFR tyrosine kinases with approximately equal potency towards recombinant FGFR1, 2, 3 and 4, as well as VEGFR1, 2 and 3 (IC50=5-35 nM). 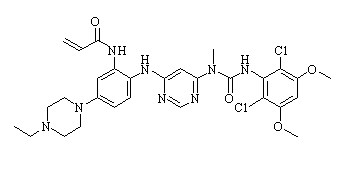 ODM-203 is an orally available inhibitor of the human vascular endothelial growth factor receptors (VEGFRs) and fibroblast growth factor receptors (FGFRs), with potential antiangiogenic and antineoplastic activities. E7090 is an inhibitor of the fibroblast growth factor (FGF)/fibroblast growth factor receptor (FGFR) pathway, with potential antineoplastic activity. 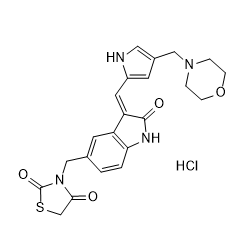 Dovitinib(CHIR-258; TKI258) lactate is a potent inhibitor of fibroblast growth factor receptor 3 (FGFR3) with an IC50 of 5 nM. NSC-12, also known as NSC 172285, is an extracellular FGF trap with significant implications in cancer therapy. 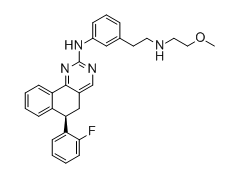 Derazantinib (ARQ-087) is an ATP competitive tyrosine kinase inhibitor; exhibits potent activity against FGFR1-3 chondrocytes with IC50s of 4.5, 1.8, and 4.5 nM, respectively.